Milwaukee Record launched on April 7, 2014. Since then, we’ve published more than 4,500 stories, reached millions upon millions of internet-weary eyeballs, and concocted all sorts of wonderful and ridiculous stuff. Now, as our fourth full year of existence comes to a close, we’ve rounded up some of the best stories we published in 2018. A huge thanks, as always, to our incredible ad partners and sponsors, our ridiculously talented writers, and our loyal readers. Thank you, thank you, thank you. The kitchen ran out of food in the middle of serving our table, so I sat there for a while looking hungry as everyone else at the table ate. There was a sense that the entire restaurant staff was straining to level-up for this formal dining experience, accustomed as they were to casually spilling burgers and fries into plastic baskets and calling it a day. My husband made use of the gap by handing me a Valentine’s card with the note, “Thank you for curating our beautiful life.” This struck me as sarcasm, frankly. We walked into the first floor bar at Holler House around 2 p.m. and received a warm reception from all 25-ish people filling the cozy space. There were two TVs above the bar, with the Brewers game on one and the Bucks game on the other. Four generations of Milwaukeeans in the room nearly spilled their chicken and scalloped potatoes after Giannis’ Game 4-winning tip-in. And, bras. There are hundreds of signed bras hanging all around the bar, left lovingly by past visitors. 6:23 a.m. – Everyone in line has run out of stuff to talk about, so we all start showing each other pictures of babies we know. Half the crowd sits on the ground. More people in IKEA dress shirts show up. TMJ4’s Shaun Gallagher casually twirls his microphone like a cool drummer would as Naughty By Nature’s “O.P.P.” plays over the speakers. We’ve been here about 90 minutes and we realize that there are still twice as many people in front of us in line as there are behind us in line. How pointless has it all become? As you’ll notice in the image above, I found out that Summerfest doesn’t even bother to list Pre-Recorded or Taped Music on its daily lineups anymore. Once symbolically reviewing an event that added nothing to the Big Gig, I was now actually reviewing something that didn’t exist. Anyway, here’s what I heard! No, this successful hometown gas station isn’t the first company to operate under two separate identities. Hardee’s and Carl’s Jr. have existed in regionally-specific harmony for decades now, just as the Hellmann’s and Best Foods mayonnaise brands have long before that. But was a name the only difference between Kwik Trip and Kwik Star? In an effort to answer this question that consumed us, we gassed up at a Kwik Trip and drove almost 200 miles to the closest Kwik Star in the Iowa border town of Dubuque to find out for ourselves. It’s easy to get sentimental about the Marsh. I grew up in Mayville, population 5,000-ish, and the Marsh was almost literally in my backyard. Thinking about it now brings back a rush of memories: fishing at my grandfather’s hunting cabin with buckets full of bullheads, building ridiculously elaborate forts with my friends, sitting on my father’s lap and steering the car as he took our family for a drive. Growing up, the Marsh was a simple fact of life, a place where generations of my family lived and played. It’s still there today, as vast and immovable as ever. Sure, you have to be welcoming to the wildness around you, but that’s what you signed up for. The goats will gnaw at your mat and nibble on your sandals alongside it. They’ll step on your toes—they may even bound onto your back. You’ll giggle initially as the first one relieves itself inches from your face, but, strangely, you get used to it. You may even wish it would have been you who went home with the day’s prize—even if it’s the byproduct of a pile of pungent pellets deposited squarely on the center of your mat. On one display stand near the cash register there were Red Vines and Reese’s Pieces and all that stuff, just as we remembered. On the next stand there were Clearance Sale DVDs available for purchase, also as we remembered. Then, of course, there was aisle after aisle of classic flicks available for rent. Titles like The ‘Burbs and Cabin Boy and Fear And Loathing In Las Vegas brought us right back to 1999. Ah, nostalgia. This felt juuuust right. For those of us who came of age around that magical 1983 calendar year, the arcade resurgence has provided something for everyone, all wrapped in a fuzzy warm glow of cathode-ray nostalgia. Certainly someday this craze will fade again, consoles will fall back into disrepair, and a sick Sinistar cab will be as rare as a magical white buffalo. But until then, we’ll be hoarding quarters and tokens the way we did back when we accepted our paper route money in coins, visions of light cycles and ghosts dancing in our heads. 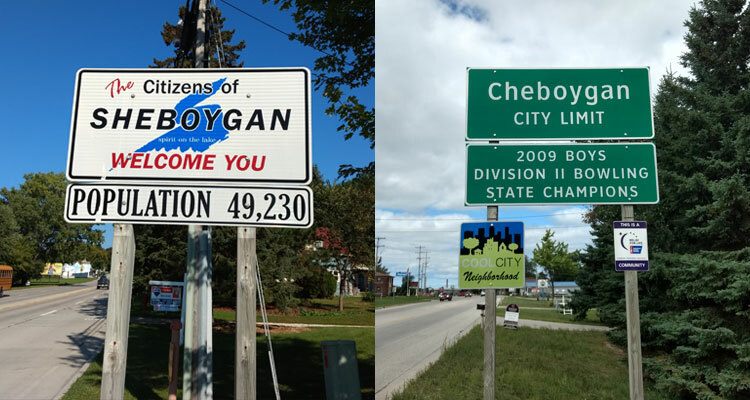 We recently travelled by Lake Express to Cheboygan, and by old Toyota Camry to Sheboygan, to record data and ultimately determine, once and for all, who’s the better ‘Boygan. The winner received a Milwaukee Record T-shirt, and the loser had to change its name to Alewife. All decisions here are final, so don’t go trying to change our minds with Duke’s Dogs or Schwarz Fish Company smoked salmon. No, wait—absolutely do that. We felt good about our impromptu time capsule. It had a picture of Uecker on the top and some Milwaukee Record stickers on the outside. We dated it. We sealed the burger in a ziplock bag. We double-bagged the entire box. We wrapped the thing in packing tape. We had failed to track down a shovel, so we dug a hole in the ground using the ice scraper from our car. 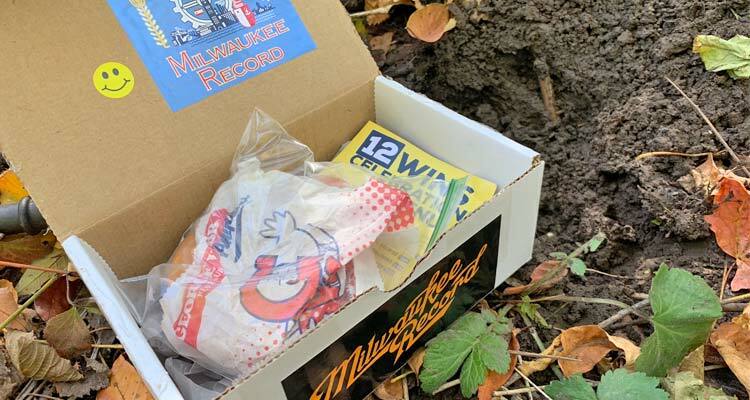 We buried our free George Webb burger in a time capsule in the woods. Oh god. There it is, dead, no more than 30 yards in front of me. What follows is a confusing, heady cocktail of emotions that blurs my vision and leaves my head swimming. Disbelief. Excitement. Confusion. Excitement again. Regret. Regret. So much regret. For the briefest moment, a harebrained scheme presents itself: When my brother inevitably calls wondering about the shot, I’ll tell him I missed. I’ll leave the deer where it is. Maybe I’ll cover it up with some branches. Maybe I’ll cover it up with some snow. I didn’t do this. It didn’t die. This didn’t happen.